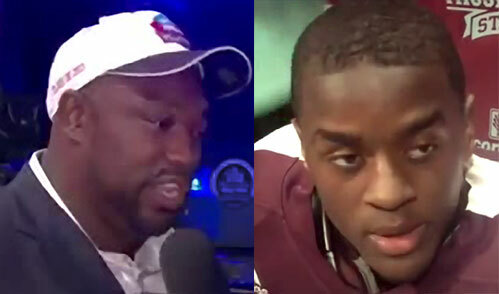 Warren Sapp, a retired defensive tackle for the Tampa Bay Buccaneers and a current NFL Network analyst, announced Mississippi State cornerback Jonathan Banks as the Bucs 2nd round pick in this past weekend’s NFL draft. Sapp was drafted by the Bucs in the 1995 NFL Draft as the 12th overall pick. He spent nine seasons in Tampa, making seven trips to the Pro Bowl and winning one Super Bowl title. He finished his career with the Oakland Raiders. Former defensive tackle and Hall of Famer Warren Sapp announced Mississippi State cornerback Jonathan Banks as Tampa Bay Buccaneers 2013 2nd round draft pick. Each NFL team had a retired player announce one of the team’s draft selections. Among the other retired players participating included Deion Sanders (Atlanta), Wayne Chrebet (New York Jets), Merril Hoge (Pittsburgh) and Steve Gleason (New Orleans). Gleason’s participation provided the most poignant moment of the entire draft because he’s suffering from ALS. Sports Speakers 360 is a sports talent agency for booking athletes. If you would like to book football speakers or NFL stars like Warren Sapp for a speaking engagement, autograph signing, VIP meet and greet, charity fundraiser, guest appearance, Super Bowl party, endorsement, social media campaign or special corporate event, you can request Warren Sapp speaker & Warren Sapp agent info or call 855.303.5450.